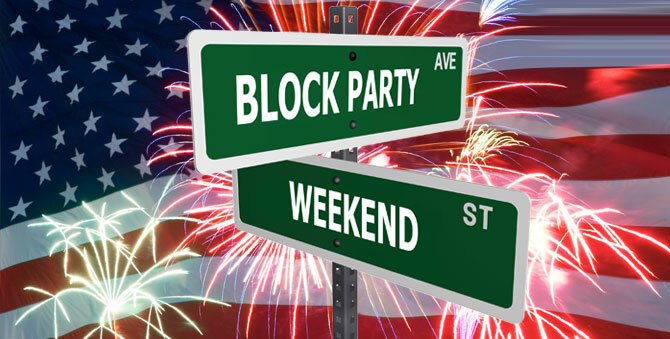 Independence Day is a great opportunity to get your neighborhood together to celebrate our great nation, and what could be more American than the block party! It is a great and inexpensive way to get to know your neighbors and add a more traditional community feel to your street. Here’s what you need to get the planning started! Party planning is fun, but it is always easier when you have help, and since it’s a neighborhood event you’ll need to get everyone involved. Approach a few of your neighbors to ask for help and to get a good idea of what day would be best to host the event. People often travel during the long weekend, so perhaps hosting the event on a weeknight may bring out more of the community. Block parties can range from a barbeque in one neighbor’s yard to a full street-wide party. If you have enough interested people and are thinking of blocking off your street to host the event, then you’ll have to contact your local city hall to get permission. This way you can be sure that no cars will disturb your set-up or cause a danger to children. In general it is usually best to have everyone bring their own drinks to an event such as this. Once the details are sorted out create a flyer to pass out to all your neighbors. It wouldn’t be a block party or the Fourth of July without food, and in keeping with the theme you should plan all-American fare such as hamburgers and hotdogs. This will make your menu easy to prepare and inexpensive as well. To cut down costs you may want to consider a potluck event. This is also a great way to get to know your neighbors and try some new recipes. If you do go with a potluck block party be sure you have a sign-up system to ensure there are no duplicates and that all the necessary courses are covered. A Fourth of July Block Party is a great way to show your American pride in your community and a fun way to spend some time with your friends and neighbors. You may even want to end the night with a fireworks display to truly get into the spirit of this important day. You may even decide to make the party an annual event!